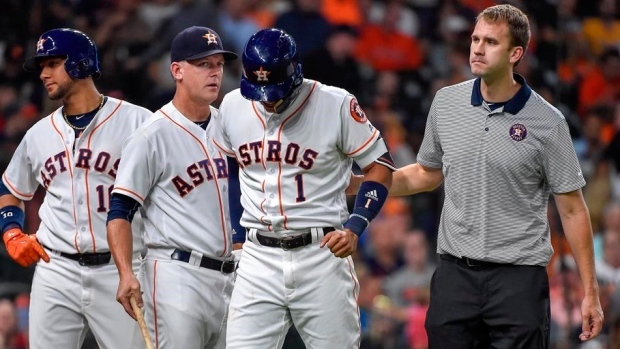 HOUSTON — All-Star shortstop Carlos Correa has left a game against the Seattle Mariners with a jammed left thumb. Correa was pulled Monday after swinging and missing at a pitch in the fourth inning. He grimaced in pain and walked around for a moment before trainers arrived. He was replaced by Marwin Gonzalez. Correa jammed the same thumb on a headfirst slide at home plate July 4 and sat out the next day. The 22-year-old Correa is hitting .320 with 20 homers and 67 RBIs for the AL West-leading Astros. He drove in a run with a sacrifice fly in his first at-bat Monday. The team says he will be re-evaluated Tuesday.